Inquiring minds want to know why we too should befriend StaticNightmares! Want to tell the world what you love about StaticNightmares? You need to log in or join our community, first! It's fast, free and easy. Responses may be slow and totally non-existent. There's too much drama right now for me to keep up with everyone replying to things I've posted and done and I just can't right now. Please understand. I may continue to take OOC and out kf roleplay, but again, responses may be slow, non-existent, or hard to decipher/may be much more dark/sad and short. Freaking out about the endless possibilities. Hoping to myself that the neighbours can't hear me. But I see what's coming next. Our fate is pulling everything apart. Got my eyes red from the crying. I think they're here to stay. But I can't trust you. Our fate pulls everything apart. And my heart is made of glass. Than feel the pain when I look at him. Why does everything come to an end? But everything about you always cuts through me. Are you wishing for me? Don't you wanna be free? These may not apply to everybody. Thank you to everyone's who's been by my side this long. For the ones who have been roleplaying with me since the first day I joined. For the ones who didn't work out but still talk to me and check on me. For those who have multiple Roleplays with me. For even the ones who have just seen me around and have stuck up a conversation on something random, or something serious, or for some advice. And thank you to those who have given me random gifts. I am a person of survival. But growing up, that was not really my title. A dead soul who was screaming for revival. Hello! I go by Static and Sarah around here. Or at least, that's what most people have decided to call me. 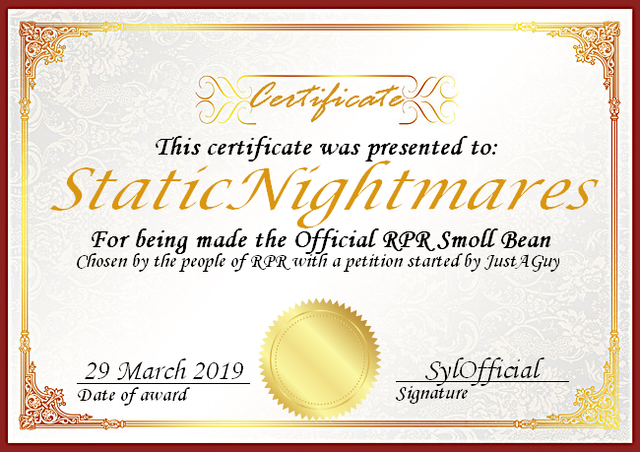 I'm the baby bean of RPR, as a lot of kind people in the Official SmallTalk chat have declared me as. I'm 14, a female, but I associate more with a masculine nature than I do femininity, so I associate myself as Transmasculine. Please note that I am autistic. While this doesn't usually effect me while I'm online, there can be circumstances where I don't respond for a while because I simply don't know how. Or I'll suddenly disappear during a serious talk because I can't handle it. I'm socially awkward but I cannot stand being alone, and being alone makes me nervous and scared. I can be incredibly clingy or incredibly distant and there's not much in-between. Sorry. It's not my fault, and I wish so much that I could change it. But at the end of the day it's who I am and it won't change, so you'll have to deal with it. I may seem disinterested or bored at points. This is usually because I'm feeling extremely depressed, anxious, or... I'm just not okay. This doesn't mean I'm tired, as when I'm tired I get very giggly and my typing speed slows down significantly. So if I seem bored or uninterested please don't take it personally. It'll probably just mean I'm going through a rough time or a stupid mood, and I just can't focus. If this happens, it usually means I need a hug, a cookie, or just someone to talk to. It is best not to pester me though, as it increases the chance of me simply ignoring you completely until I feel better and am able to speak. Anyway, now that that's out of the way, hewwo! As said, I'm the baby bean of RPR to most people, and can often be found on the SmallTalk official chat. And I'm constantly posting new RP Ideas on the LFR forum! I love big husky dogs, my boyfriend, brownies and big fluffy blankets! Most of my characters deal with heavy topics. Most deal with mental illness, family issues, eating disorders, etc. So if you are not okay with it, don't bother trying to hit me up with one so you can just bail on me later. Pretty much 100% of my roleplays have romance in them. It's unlikely that I will do a roleplay that doesnt have some sort of romance in it. So dont request it. I felt the hits and the kicks of society. So I became the best example of neglection. She is pretty amazing, her RPS have an amazing level of detail and evoke such emotion, it's really quite frightening. She can do a pretty good drama filled RP as well!